On a tropical February afternoon the only hot team on the pitch in this World Cup qualifier was Honduras. Recently christened as the next big thing after their performance at the Olympics, the Catrachos showed why they are now a feeder team for European soccer. Team USA, on the other hand seemed to have fallen flat in their performance. Now, like many of us out there, the fact that beIN Sport carried this match meant that fewer of us were able to enjoy (or suffer through) the game. No mainstream coverage might hurt in terms of fan base support. Yes, there are online methods to watching sports nowadays, but if you constantly rely on DVR, that is just not in the cards. Not watching the game aside, I think there are enough commentaries online about the team's lack of fitness (what? ), poor forward options, an inexperienced back line, and no creativity in the midfield. Landon Donovan, we are waiting. That the goal came from Clint Dempsey should be no surprise. He can easily carry this team of there is some semblance of defense. 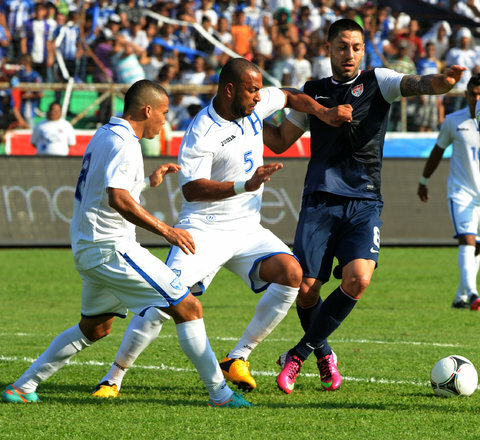 Honduras' late goal exemplifies how centerbacks need experience and poise. A bicycle kick rarely works because Bocanegra would stand in the way. Timmy Chandler, although finally cap-tied, may not have replaced Cherundolo just yet. He also fell flat from what I've read and the highlights I've seen. It can be argued that this qualifier may not see the US advance to the World Cup with a game in hand, as it did for 2010. It may come down to a visit to Panama in October or a playoff with another conference. At least the way they've been playing meaningful matches. Winning in Italy and Mexico in friendlies isn't as impressive when qualifying is this hard. A glimmer of hope exists, however. Mexico, one of the best teams in the world, was unable to defeat Jamaica on their home turf. So that's 2 less points for our neighbors to the south. But you can be sure that they will bring everything to the match versus team USA next month. Another subject here worth noting is that there are 9 matches left and plenty of time to regroup and get Donovan back in action. Nice post bud, I watched the second half of the Mexico game and they did look really flat and uninspired themselves. Jamaica's goalie also made a couple of great saves to preserve the tie. It will be interesting to see how this all plays out. We are screwed. Time to give up. I base that on absolutely nothing.